A beautifully presented modern, east facing penthouse apartment in Playa Flamenca, within the secure gated community of La Calma. La Calma has 4 pools throughout the complex, all set in beautiful palm tree grounds to choose from. Close to the apartment, within a 5 minute walk, there is 2 supermarkets, plus bars, restaurants,shops,banks,ATM's,and the Playa Flamenca commercial centre, home to cuisines from around the world. There are many quality beaches within a short walk, such as Playa Flamenca, La Zenia, Cabo Roig and Punta Prima. Within approximately 15 minute drive, you can find several quality golf courses, including Villamartin, Las Ramblas, Las Colinas to name a few. Also in the apartment, there is a well equiped open plan kitchen, including dish washer. The dining/living area has dining table, chairs, 'L' shaped bed sette and patio doors to the balcony. There is super fast fibre optic broadband installed and a flat screen smart TV which has internet TV with hundreds of channels including films,sport children's channels and more. There is also a utility room which has a washing machine should you wish to use it. Please be aware that bookings out of season are booked at 100€/week plus bills. There is a 60euro charge payable locally on arrival to our keyholder to cover meet and greet costs, the services of our keyholders during your stay and cleaning and laundry on your departure. When keys are handed over, a RETURNABLE deposit of 150€ is payable ( this can be transferred to my account if you prefer, please ask for account details),to cover breakages and key return, ( the electronic keys that gain guests access to the complex via the car and pedestrian gates are €50 each to replace),this will obviously be handed back at the end of you're stay,( when my manager has checked the apartment and keys have been returned,, ( or I will transfer back,when informed all is ok by my manager). My manager also offers pickups from Alicante and Murcia airports if required, prices on request. We hope you have a fantastic stay. There is a 60euro charge payable locally on arrival to our keyholder to cover meet and greet costs, the services of our keyholders during your stay and cleaning and laundry on your departure. When keys are handed over, a RETURNABLE deposit of 150€ is payable to cover breakages and key return, this will obviously be handed back at the end of you're stay, when my manager has checked the apartment and keys have been returned. My manager also offers pickups from Alicante and Murcia airports , prices on request. Modern apartment in a secure environment. Walking distance for several quality beaches and a large retail park with lots of eateries available. I spent 2 month Dec/Jan and wasn’t bored once, thoroughly good stay. So glad you had a brilliant stay, and enjoyed the apartment. You have been a great guest and are welcome back anytime. Thanks so much for your glowing review. Lovely clean and tidy apartment. Modern with all facilities required. Well located for shops and 15 minute walk to variety of beautiful beaches. First of all thanks for your booking, and really appreciate your positive review. Apartment was clean well presented and was as described in the advert. It had all that you could ask for for a short or long break holiday. It felt very secure and private with its gated complex. A real plus was the roof terrace as thre is no balcony sun until later afternoon/evening if you didn’t want to go to the pool. The apartment is very convenient(walking distance)to shops bars and restaurants and a short taxi ride to other commercial centres ie La Zenia,Cabio Roig or La Florida. Only minus(very small criticism)is my wife would have liked a full length mirror. So glad you both enjoyed our apartment and the playa Flamenca area. Thank you for your lovely and honest review, next time I am there I will be purchasing the long mirror that you mentioned, as I'm sure your wife won't have been the first to have missed that after changing for the evening. Thank you for your booking and you are both very welcome anytime. Sorry to hear of your illness, nothing serious I hope? ?, apart from that so pleased that you had a great time in La Calma, and enjoyed our apartment. Thank you also for your glowing review, much appreciated. Guests like yourselves are always welcome back anytime. Just back from our holiday don't have any complaint about apartment at all. Beds all very comfortable and everything you could need in the apartment for your stay. Apartment was clean and tidy when we arrived and Andy was very helpful ...will definitely book this apartment again. So glad you all had a great time, and thanks for your positive review of our apartment. Your are very welcome to stay anytime. 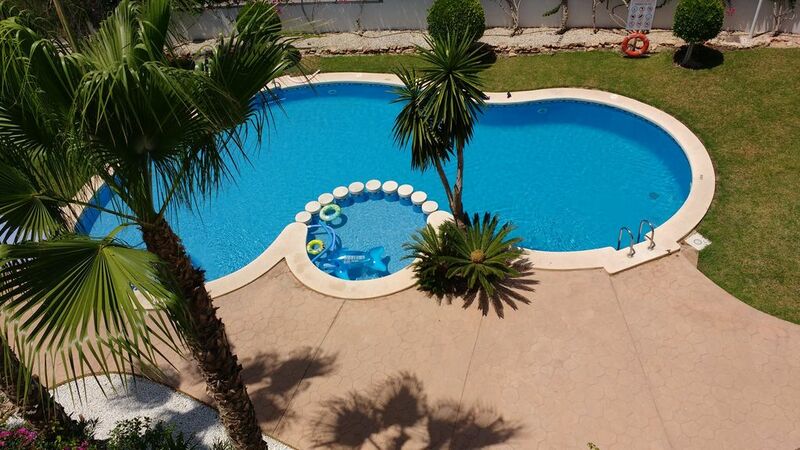 A fabulous apartment and complex to spend a very relaxing and enjoyable holiday!! Thanks for your glowing review, we are so pleased you two have enjoyed your stay once more. We are obviously doing something right, but that is only because lovely guests like yourselves leave there comments here, which helps not only us but future guest make an informed decision about their holidays. Thanks for your kind word's and of course your booking. It goes without saying lovely guests like yourselves are always welcome back anytime, and we look forward to hearing from you in the future. The 60€ cleaning fee and the refundable 150€ keys/damage fee should be paid to key manager when keys collected. The keys/ damage fee will be refunded after by manager is satisfied the apartment is in order and all keys returned. Due to excessive use of the air conditioning ( being left on all day/ left on with all doors open), and therefore excessive electricity charges, a KW/hr meter has been installed and an amount of 100KW/hr / week is applicable, included in you're booking, any usage above this has an additional charge applied of 25 cents / KW/hr.